Phillipa Gaines was the national project manager for the New Zealand Classification and Outcomes Study (Gaines et al., 2003) which also produced a compendium report on the Outcomes for New Zealand Mental Health Consumers (Trauer et al., 2004). In her role with the Ministry of Health (2003-2006) she chaired the Mental Health Research and Development Strategy Group, which included a focus on the identification and development of outcome measures for routine collection and use by mental health and addiction services. Lattice Consulting continues to be interested in the use of nationally mandated outcome measures but in recent times we have become more interested in assisting organisations to grow their own evaluative knowledge and develop their own service improvement capability, including the ability to measure outcomes for service users, irrespective of whether or not they use a specific outcome tool. This shift in our focus from outcome measurement to outcome management is also consistent with the government’s emphasis on results (States Services Commission, 2012), but the Lattice Consulting philosophy is that the process of change is very much a human one to do with fostering the right leadership, organisational climate and culture with an emphasis on conversation and co-production at its core. Lattice Consulting is also interested in the power of collaborative partnerships amongst providers in the achievement of large scale impact. In the 1980’s this approach might have been called ‘service integration’- a term which WHO (2008) said “aroused strong feelings and provided much scope for misunderstanding and fruitless polarisation”, mainly because the term included many hybrid versions of an ‘integrated health service’ that were very context specific. In 2012 the focus is still on seamless service delivery (integration), particularly with the inclusion of primary health care services, but it now includes a much stronger emphasis on the end result (impact), especially from the perspective of the service user. Hanleybrown et al. 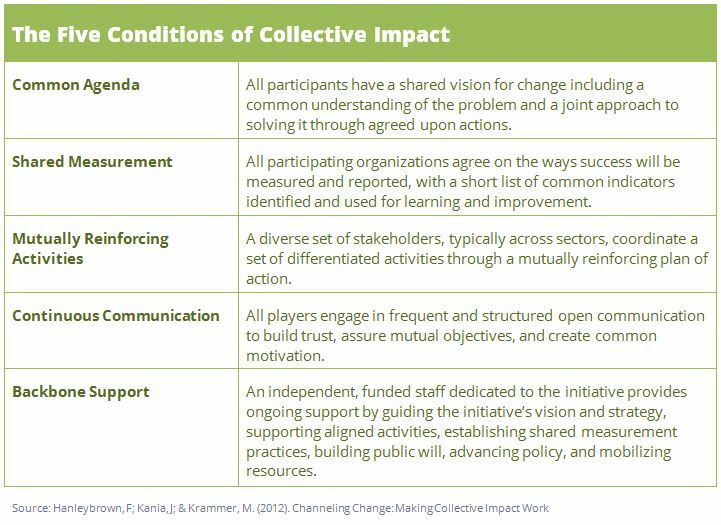 (2012) maintain that there are five key conditions which differentiate collective impact from other types of collaboration. Lattice Consulting is not sure that the backbone support has to come from an entirely separate organisation to the service providers, but we do acknowledge that the support role is essential to the success of a collective impact initiative. Another rich source of practical information about how to join up the horizontal with the vertical (in order to achieve collective impact) can be found in the Institute of Policy Studies’ publication Better Connected Services for Kiwis (2008) - PDF (3.9MB). World Health Organisation. (2008). Integrated Health Services - What and Why? The transformation of the health system will not be brought about by using the concepts and tools of the past (i.e. technocratic, top-down managerialism).